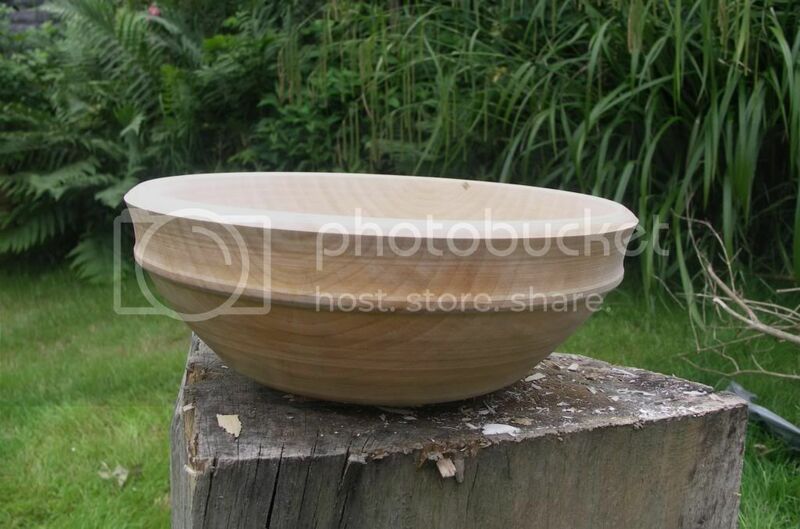 I've always wanted to have a go at turning a big bowl. Most of the ones I've turned before have been between 6 and 7 inches in diameter. This is the perfect size for an eating bowl, in my opinion, but as I am the only one in my house that will use a wooden bowl (I'm working on my sons), that doesn't make them terribly useful. So a big bowl would not only be a new challenge, but would prove useful in the house for holding fruit or as serving bowls. I guess 'big' is a relative term as I have seen examples of some huge bowls, but in his excellent book The Wooden Bowl, Robin Wood classes the Medieval bowls between 10 and 16 inches as large bowls, so that's good enough for me. The two large bowls that I turned are 10 and 10 1/2 inches in diameter. Both from the large horde of sycamore that I recently acquired. In both cases the hardest challenge was preparing the blanks for the lathe. With something this big it really is important to get the blank as close to the desired outside dimensions as possible, especially if you don't want your lathe to wobble it's way across the workshop. Ideally I'd use a chainsaw and a bandsaw, but I don't have a bandsaw and my chainsaw is very temperamental. I did have a go at using the chainsaw with one of the blanks and found it to be a very unenjoyable experience, noisy, smelly and messy. So they were mostly prepared with an axe, much more enjoyable, but hard work. I have to confess that I tire very quickly doing this sort of work with an axe. I guess I don't do it enough to build up the strength. Turning the lathe on once the blank had been mounted was a bit scary. I made sure that I took all of the safety precautions. I also put all of the heaviest things I could find in my workshop on the shelves of my lathe stand so as to weigh it down and reduce vibration. I was quite pleased with the result and besides the extra bit of time it took to prepare the blank, it didn't really take much longer than the smaller bowls I turn.